Lots of people try to save money on carpet padding. What they don’t realize is that padding can protect you from seeing imperfections in your floor, if there are any. Padding can also do an incredible job of absorbing sound which makes your house a lot more enjoyable. Temperature control is another awesome area where quality padding can assist you in keeping your home climate from shifting so much. As far as carpet buying tips this is a huge one. Don’t go fast to buy any type of pad ask your supplier what is best for your situation. Usually, like everything, there is multiple types or styles of anything. This is especially true in the carpet world. Viewing these different styles is more then just a flavor choice, it can mean big changes in your home. First of all some carpets will show more vacuum tracks or foot prints which can sometimes cause an eye sore. Some carpets will offer a better high traffic tolerance which will save you in wear and give you a longer stand on your purchase. Different styles of home carpeting can have instant appeal to either be real inviting or some can be harsh looking or not so plush soft looking. Certain carpets have certain attributes to them that cause them to be higher in cost then others. Like stain guard or higher priced materials like wool. Instead ask yourself whether this room or that room actually needs stain guard or maybe instead of wool, you get a synthetic that will be more cost effective and feel the same anyways. If you have high traffic then maybe choose carpet tiles instead of roll carpet so you can replace those carpet areas with a lot less expense. These carpet buying tips will dramatically save your pocket book. Is it a stain resistant carpet or not? If it isn’t there is going to be more expense or work entailed in keeping it clean. How often is that specific type of carpet required to get a cleaning and what type of machine is needed to perform the work. Different machines have different cost operate or rent. Do you have to have wool carpet or can you go with a synthetic fiber brand that feels just like it? Be sure to check both, you might be surprised. That choice alone saves lots of money. Most carpets if not all come with some type of protection from the manufacturer. Find out which carpets give you a little more protection then others. Does it have stain protection, crushing, or wear protection? What are the terms that make or break those claims? These are really important questions to ask. Just like anything else, changing the color or shade can really alternate the mood. How you feel around bright red is completely different then when you are around ocean blue. Your flooring choice touches every wall so it has great impact on every room. Light colors make the room look bigger, while darker colors close the room up and shrink it. Also certain colors fade easier in sunlight, so if you have lots of windows in one room you may consider different colors. When you put carpet on stairs it definitely takes on a different shape then laying flat. So in turn you will need to have a carpet that can form to that fit. You get different wear on a stair step then on a flat floor because of the way your foot comes off the step. So you need something that won’t wear as easy. You also slide a lot on a stair step, meaning looped carpet or snaggy carpet might not be the best fit. Because the carpet bends over the front of the step you might want a fuller carpet style because otherwise you might be able to see the backing of the carpet. 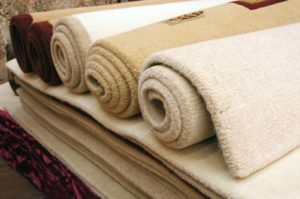 These carpet buying tips should save you tons of money, time, and lets face it agony from the situation of choosing the wrong type of carpet. There are great ways to shop now! Shopping online has been saving people tons of time and money in the long run. Especially since you can buy flooring online, with all the great images available and ability to get samples for free mailed to your door. I have friends that have been in the flooring industry for over 30 years and I actually helped put in a floor for their entertainment room which was ceramic tile. The owner of the company explains to me all the time the inherit concerns of the people he contracts all the time in the flooring industry in terms of valuable material for all situations.